British Prime Minister Tony Blair arrived for a meeting Friday with South African President Thabo Mbeki as he wound up his farewell tour of Africa. Blair arrived to a 19-gun salute and full guard of honor at government headquarters for a meeting expected to include issues such as the crises in Zimbabwe and Darfur, as well as the upcoming Group of Eight summit of industrial leaders. 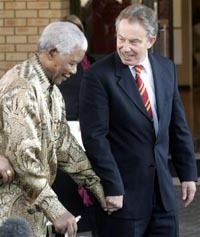 Blair made Africa the focal point of Britain's presidency of the G-8 in 2005 - though critics say many of the promises made during that time have not been honored. In a speech to the University of South Africa on Thursday, Blair said it was vital that the G-8 did more to help Africa's poor. But he also said African leaders must take tougher action against Sudan - where the government is accused of backing militias responsible for the mass killings in Darfur - as well as Zimbabwe, where President Robert Mugabe's policies have led to economic and social collapse and political repression. Mbeki, the African mediator on Zimbabwe, has stuck to his policy of quiet diplomacy toward Mugabe, even though this has failed to persuade the 83-year-old leader to embrace political or economic reforms. Britain - Zimbabwe's former colonial master and its most strident critic - wants Mbeki do more to pressure Mugabe into change.